When you sponsor a child you are making a big difference in their life. This page is for you to sponsor a child. Your gift of $45 per month per child can be life changing. But just in case you wanted to make a one time donation or something else we’ve put these buttons here for you. Your generous support blesses our children and has impact. Our heart is to make a difference in the lives of orphans and kids living in poverty. 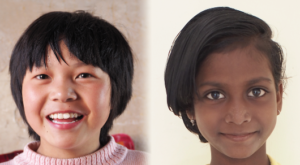 Children in our foster homes in China and the orphanage in India are so special. They are learning to trust and laugh again. Children who would have been forced to leave school are able to continue, some, like Ru, to university level. Historically 83% of your gift goes to our child projects. That means more impact for your gift. If you have any concerns about using our secure form you could phone us. Our phone details are here. Child Sponsorship is $AUD45 monthly. Not sure how much $45 Australian is in your currency?